I've noticed lately when writing my reviews and considering how I feel about an album that I often use terminology appropriate for a food review. It makes sense since I consume music much like I do food. And this month is like a 3 course meal of deliciousness. Last week I mentioned the four new albums being released that I was very excited about. They were as phenomenal as I expected. I'd have to say that the St. Vincent/David Byrne release was my favorite, but I tend to listen to the new Avett the most. I was so surprised to see that they were all available immediately on Spotify! I thought Spotify was like the Netflix of music. You have to wait 6 weeks or something before you can get the new stuff, but apparently that's not always the case. Um, yeah! And now this week, three more awesome new releases! I just fell in love with Band of Horses last year, so I showed up fashionably late to this party, but I was instantly smitten from the first time I heard the words "If I could sleep..." sung. Grizzly Bear is taking over my favorite radio station on SiriusXM this week and playing stuff from the new album and so far, it sounds fantastic. Very much right up my alley. I have always loved everything The Killers have done. There's not a song they've sung that wasn't delightfully different. But. Everything about this new album seems so mainstream, 80's rock. I don't know how I feel about this. We'll see, I guess. This is all pretty exciting, really. But do not underestimate my excitement for next week. With Mumford and Sons' new album, Babel, being released (9/25), I just might throw a party. Are there any new albums you are excited about? 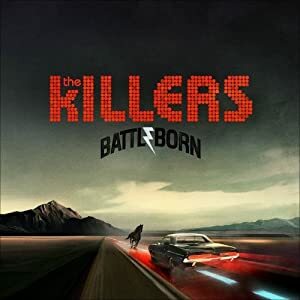 There was a moment when I loved the killers - and then I stopped listening to them. Now whenever I go back and try - it's just not the same. It's a bummer because I was really, really into them. Do you think this album is worth a listen? Ahhhh Band of Horses. Love it! Also, I remember my mom getting me Sam's Town for Christmas one year. I don't think I liked the Killers until that album.